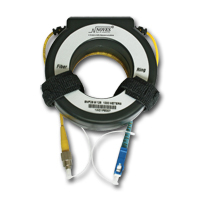 Measuring an insertion loss of the near-end and / or far-end connection of a fiber optic link with an OTDR requires a launch and / or receive test cable. A launch cable, which connects the OTDR to the link under test, reveals the insertion loss and reflectance of the near-end connection. A receive cable, which connects to the far-end of the link, reveals the insertion loss and reflectance of the far-end connection. Launch and receive test cables can range from 150 m to 1 km (or longer) in length. Because very long test cables are impractical to transport and use, Noyes offers coiled lengths of 50 mm multimode, 62.5 mm multimode, or single-mode fiber packaged in compact rings. Fiber Rings of 150 m of fiber are ideal for premises fiber network test applications. Fiber Rings of 500 m and 1 km of single-mode fiber are designed for broadband, long-haul fiber network test applications.